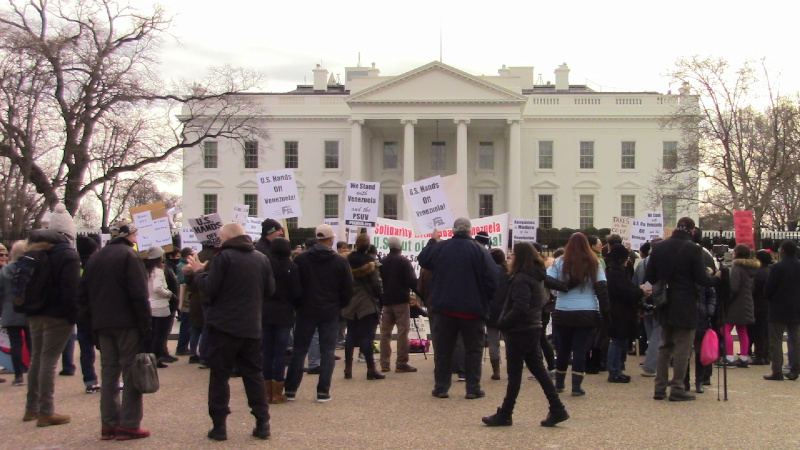 On the 26th of January, a second round of protest against US interferect and support for a possible coup in Venezuala took place in front of the White House. Trump has unilaterally recognized Juan Guaido as President of Venezuala, even though he has attempted to declare himself President outside of any election process. During the protest a speaker mentioned some ugly facts about Guaido. He has declared himself in support of Brazil's new fascist President Bolsonaro. Bolsonaro in turn has turned out to be connected to death squad activity in Rio de Janero. In other words, the is the same old coup and death squad activity, the same "death squad democracy" in Latin America the United States has always stood for. Any legitimate revolutionary in Latin America would either repudiate Trump's support or maybe even abandon his claim to the Presidency so as not to rsk handing his country over to a longtime foreign enemy.